MALIBU, California – The cars that will have the hardest time adapting to our electrified future will undoubtedly be the American muscle cars. We admire these rudimentary machines for their charming character embodied in their V8 engines. Any performance enthusiast will tell you, nothing compares the instant torque and sound produced by a thunderous American eight cylinder. How on Earth will these cars survive in a world of batteries and artificial engine sounds? For the Ford Mustang, iconic American sports car, admired by all generations, young and old, for over fifty years, it’s important that a transition to the world of tomorrow be executed smoothly if the car is to remain alive at all. The 2018 Ford Mustang is therefore chapter one in a crucial transformation. If Ford wants to convince consumers that a Mustang can still be cool without a V8 under its hood, it must first offer them an alternative that’s actually worth considering. That’s where the EcoBoost four-cylinder turbo comes into play. Since its inception in 2015, this tiny unit earned the respect of enthusiasts by offering similar performance to previous V8s. This engine is so good that Ford has officially discontinued the V6 in favour of it. For 2018, only the 5.0-litre V8 and the 2.3-litre four prevail. Speaking of power, the EcoBoost’s horsepower figure remains unchanged at 310. However, torque is significantly upgraded at 350 lb.-ft. Another important upgrade is the all-new ten-speed automatic, the same gearbox as in the F-150. That being said, the 2018 Mustang isn’t entirely new, but rather an update of the current generation. Ford has nevertheless reworked its design. Changes are subtle, but parked next to last year’s car, you instantly notice the remodeled front fascia, the rear remaining relatively the same. The same goes for the interior, which goes relatively unchanged, except some alterations in material quality. It’s frankly improved, especially the hard plastic over the centre console which is now softer to the touch. Ford’s SYNC 3 infotainment system remains effective, but a tad hard to comprehend at first. 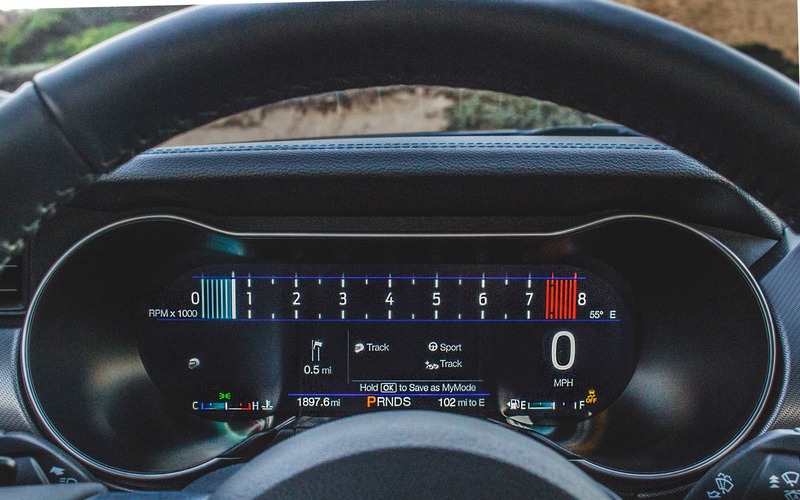 The only real change in the cabin is an all-new digital gauge cluster, now presented in the form of a 12-inch LCD screen. The latter is fully customizable, and alters its interface according to selected drive modes. It’s actually kind of a gimmick; however when regulated to Track mode, the tachometer turns into a vintage horizontal bar that dominates the entire display. And that, I must admit, is very cool. 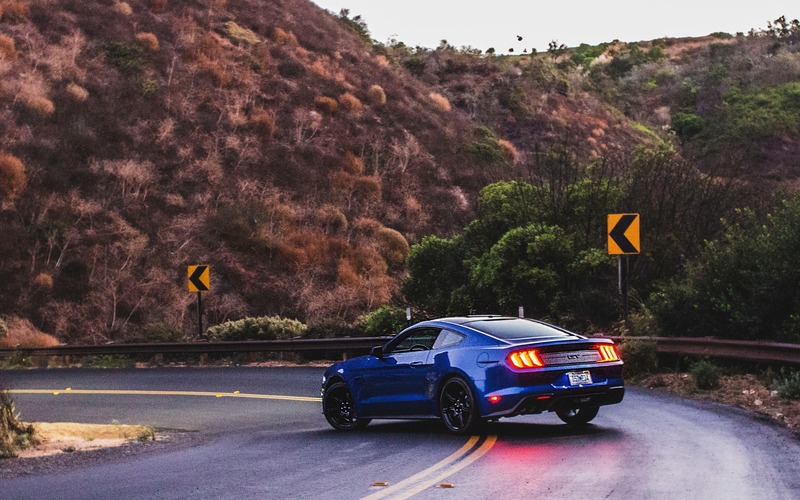 I had the opportunity to drive both versions of the Mustang on California’s sinuous roads, where I was impressed by the car’s chassis dynamics, which have been significantly tweaked for 2018. In fact, the Mustang is officially no longer a muscle car, it’s a genuine sports car now, and on par with the best Europe has to offer. In four-cylinder trim, the immediate noticeable element is a light and agile front end, especially when entering a tight bend. In this version, the Mustang is considerably lighter overall, and its handling characteristics strangely resemble those of a smaller sports car such as a Subaru BRZ or even a Nissan 370Z. And there’s definitely no shortage of power from that four-pot, everything happens in the low to medium rev range, and revving it up high is all but useless. In fact, the EcoBoost’s power deliver would humiliate much larger-displacement engines. Although remarkable from a performance standpoint, the EcoBoost emits an unusual and rather annoying engine note, resulting in a Mustang that sounds more like a German hot hatch than an American sports car. Ford attempted to fix this with a simulated engine sound, but the result is more of an exaggerated raucous than a pleasant melody. The new ten-speed automatic impresses by the quickness of its upshifts, but disappoints by the delay its downshifts are plagued with. This seems to be a common problem with small-displacement engines coupled with all too many gears. Because they require lower gears to maximize their torque curves, these engines demand more downshifting, resulting in more delays. In the V8 car, this isn’t an issue given the immediate available torque from the engine. That said, the four-cylinder’s performance quotient remains sufficient, even for diehard horsepower addicts, and proves that a Mustang can still be fun and fast without its V8. 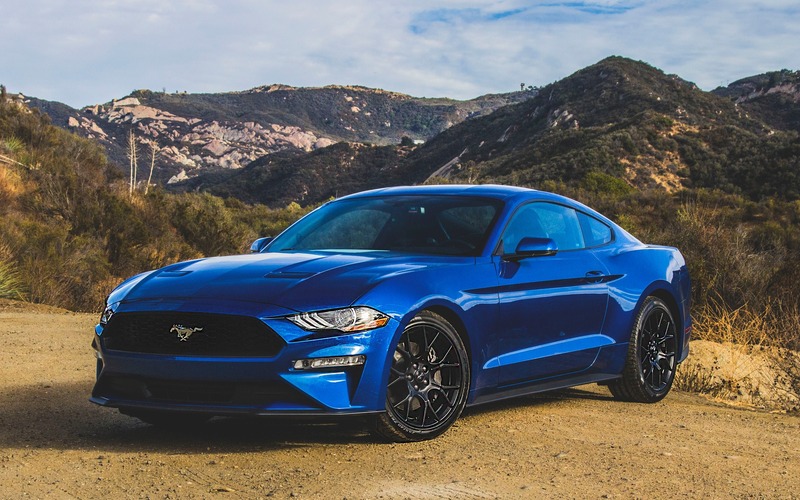 Despite the EcoBoost’s solid competence, it’s really the GT model, with the V8 engine, the manual transmission, and the Performance package that gets your pace going behind the wheel. It also makes you realize how hard it will be for these cars to transition to our inevitable electrified future. Because no matter how good the other stuff will be, nothing can recreate the sensations of a roaring American V8. Nothing. For 2018, the 5.0-litre, which remains direct-injected, receives an important bump in horsepower from 435 to 460. The manual gearbox was also given shorter ratios, the clutch pedal is now more robust, and the car gets a lighter flywheel so the engine can rev more freely. Another big change for the V8: you hear it now! Contrary to previous model years, which had received complaints from consumers for being too quiet, this one gets an active exhaust which alters its sound depending on the selected driving mode. Set it to Track, for instance, and the car instantly becomes an audible blur of American iron, similar to the Shelby GT350. Put the Mustang back in Normal mode however, and it suddenly becomes as silent as a midsize sedan, which means your neighbours will like you a lot more the moment you’ll head out for a drive. As far as handling goes, again, the car is excellent. Thanks to an independent rear suspension, and adjustable Magnaride dampers, the Mustang GT remains planted to the ground, especially during quick transitions. In the bends, the V8 car remains nose-heavy. You need to be patient and let the front end do its thing before mashing the accelerator. But the V8’s immense torque allows you to compensate in the straights and thanks to wider tires, the car’s handling limits are much higher, allowing you to enter a corner faster and harder. It was behind the wheel of the 2018 Ford Mustang GT that I realised that the end of an era is just around the corner. Actually, this new Mustang presents us two cars, the pony car of tomorrow, with the 2.3-litre EcoBoost, and the pony car of yesterday, with the 5.0-litre and the stick. Ford speaks of a potential hybrid Mustang for 2020, and very soon, we’ll undoubtedly be introduced to a fully electric one. All of that is great for our planet and the survival of humanity. And with the new types of technologies that will be at our disposal, I’m not worried that these new Mustangs will be just as quick and fun to drive as these ones. That’s all fun and good, but for now, I’m sorry, but in my book, a Mustang needs a V8 under its hood, and three pedals behind its firewall! 6/10	On California roads, we observed a 11.2 L/100 km average. For a V8, that's excellent. 6/10	The Recaro front seats are hard and too aggressively bolstered, the rear seat is nonexistent. 8/10	The V8 engine loves to rev all while offering good low-end torque, and the Mustang handles as well as the best sports cars out there. 6/10	Ford SYNC 3 is effective and operates well, but the learning curve is steep. 10/10	The sound and power delivery of the V8, the slick-shifting manual transmission, and the high handling limits make it seriously fun to drive. 8/10	A dying breed that delivers the sounds, emotions and performance we expect from such an American icon.